A government official for a Central Pennsylvania county is being asked to resign by some after posting a slew of anti-Islamic posts on social media. Mifflin County Commissioner Lisa Nancollas, on her since-deleted official campaign Facebook page, drew heat for a recent post that read "No Islam Allowed" with a red "No" symbol over a mosque, according to the Centre Daily Times. Since then, a petition on MoveOn.org has asked for her resignation over the "bigoted" posts. As of Thursday morning, it had almost 5,000 signatures. "An elected official who holds these views can not represent all of the people," the petition reads. Nancollas doubled down on her original posts, despite getting rid of the page. She said in a statement to PhillyVoice that when she was elected, she took an oath to protect First Amendment rights and said her Christian faith is an important part of her life. She said "Radical Islamic terrorists" pose the greatest threat to the country and even took a shot at Philadelphia Mayor Jim Kenney over the city's "sanctuary city" policy, which limits cooperation between local law enforcement and federal immigration officers. "The Obama-Clinton immigration plan is to simply grant amnesty to those seeking to enter our country," she said. "Meanwhile, Governor Wolf and Philadelphia Mayor Kenney have put our state at risk by allowing a sanctuary city right here at home." Nancollas did add in her statement that all Americans, "no matter our faith," have a duty to protect the country. "I will work tirelessly to ensure that our lives are not in danger and I will never apologize for protecting our freedoms," the statement read. While her campaign page is gone, Nancollas' personal Facebook page is still up. 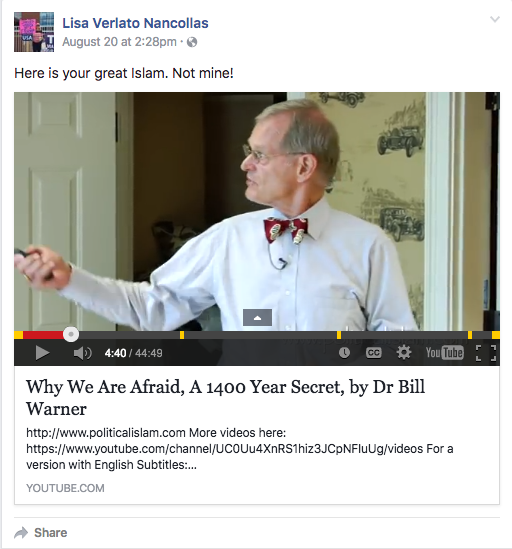 On it, she has recently posted several videos and photos from groups such as "Ban Islam NOW" and "Political Islam," the former of which says on its website: "Political Islam has subjugated other civilizations for 1400 years." This post is from Mifflin County Commissioner Lisa Nancollas' personal Facebook page. She has come under fire for anti-Islamic posts to her campaign Facebook page, which has since been deleted. According to the Lewistown Sentinel, Nancollas was elected to a four-year term, along with two other commissioners, in November 2015. She previously was a coordinator for the Pennsylvania Tea Party Patriots, the newspaper reported.